Appreciated in 1909 as one of Zuloaga's most impressive works, Lucienne Bréval as Carmen continues to appeal to viewers who visit the Hispanic Society's exceptional collection of works by that artist. Zuloaga himself considered it one of his best pictures, as he wrote to Huntington in April 1909 when he learned that the Society would purchase the painting. Before the New York exhibition, Zuloaga had shown the work in 1908 in Paris, at a time when Parisian passions for the theater and things Spanish still coincided. One reviewer wrote that Zuloaga was the painter of Carmen and the Toreador she loved, Escamillo. Seeing Zuloaga's Bréval as Carmen, he wrote, one could feel transported to Seville where a real Carmen enticed. Lucienne Bréval as Carmen, however, represents a carefully staged moment from the second act of Bizet's opera. Looking out at the audience, the French soprano dances while singing a gypsy song in Lillas Pastia's tavern. Even after Zuloaga completed the painting, the subject continued to attract the artist. He participated as set designer and adviser regarding costume in an Opéra-Comique production of the opera that starred Lucienne Bréval. His interest in the production of the opera doubtless informs his canvas. 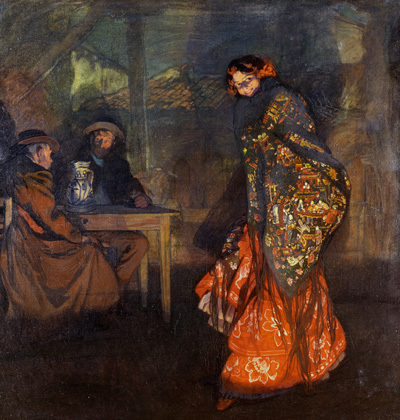 While Zuloaga represents "la Bréval" singing and dancing off to the right, he still guarantees her primacy by his handling of the stage lighting, the vibrant coloring of her costume and her position at the front. Attention to background figures and backdrop, all very probably as he would later create them, replaces his usual noncommittal background.